Left: optical image of Centaurus A, showing its prominent dust lane (ESO/IDA/Danish 1.5 m/R. Gendler, J.-E. Ovaldsen, & S. Guisard, ESO). 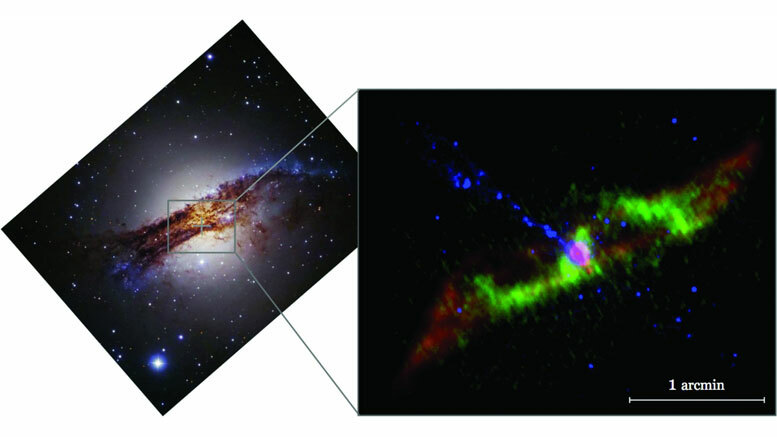 Right: the molecular gas as traced by our SMA CO(2–1) observation (green), PAH and dust emission at 8 μm observed by Spitzer (red; Quillen et al. 2006), and the Chandra X-ray observations of the jet (blue, NASA/CXC/M. Karovska et al.). Note that the spiral and the 8 μm emission in this panel are within the optical dust lane visible in the left panel. The most prominent features of the 12CO(2–1) emission are consistent with those of the 8 μm emission, but the CO shows the spiral arms. There is a CO absorption feature toward the unresolved compact continuum component located toward the AGN (Espada et al. 2010). Note that the jet is nearly perpendicular to the circumnuclear molecular gas at the base of the spiral arms, but not to the outer component. Scientists at the National Astronomical Observatory of Japan & Harvard-Smithsonian Center for Astrophysics discovered that elliptical galaxy Centaurus A also shows signs of a spiral galaxy. Cambridge, Massachusetts – Most big galaxies fit into one of two camps: pinwheel-shaped spiral galaxies and blobby elliptical galaxies. Spirals like the Milky Way are hip and happening places, with plenty of gas and dust to birth new stars. Ellipticals are like cosmic retirement villages, full of aging residents in the form of red giant stars. Now, astronomers have discovered that one well-known elliptical has a split personality. Centaurus A is hiding a gassy spiral in its center. Centaurus A isn’t your typical elliptical to begin with. Its most striking feature is a dark dust lane across its middle – a sign that it swallowed a spiral galaxy about 300 million years ago. Centaurus A slurped that galaxy’s gases down, forming a disk that we see nearly edge on. From our point of view, any features in that disk have been hidden by the intervening dust. To tease out the disk’s structure, Espada and his colleagues used the sharp vision of the Smithsonian’s Submillimeter Array. This radio telescope can see through dust to pick up signals from naturally occurring carbon monoxide gas. By mapping the gas, the team unveiled two distinct spiral arms within the galaxy’s core. These gaseous tendrils have sizes and shapes similar to spiral arms in galaxies like the Milky Way. Also like the Milky Way’s spiral arms, they are forming new generations of stars. These findings were published in The Astrophysical Journal Letters. 2 Comments on "Centaurus A Hides a Gaseous Spiral at its Core"
This post was from 2012….Not sure why there was a mistake in the title, but it has been corrected. Thanks!